Theo (Theophile Baquet) and Daniel (Ange Dargent) have to avoid trouble on the road in "Microbe & Gasoline. Photos from "Microbe & Gasoline" Facebook page. WATCHING a coming-of-age-movie is always a tricky proposition. The viewer never knows what s/he is going to get. It can be insultingly shallow, puerile, gross. It can also be intelligent and thoughtful. Thankfully, Michel Gondry’s “Microbe & Gasoline” (“Microbe et Gasoil”) is the latter. The film has its U.S.
premiere today at the 53rd New York Film Festival. Microbe/Daniel (Ange Dargent) and Gasoline/Theo (Theophile Baquet) are like a Reese’s peanut butter cup. The whole is greater than its parts. Both are outcasts. Microbe, because he is diminutive compared with his classmates. Gasoline, because he reeks of petrol and is the new kid in school. In each other they recognize brilliance and a kindred spirit. The boys bond almost instantly. MG, an Academy Award winner for the screenplay of “Eternal Sunshine of the Spotless Mind” wrote the script. As in that film, in “Microbe & Gasoline” he employs touches of the fantastical. The boys not only build a car that looks like a small house, they – unbeknownst to their parents – embark on a roadtrip in it. How they avoid an encounter with the police is the stuff of pure fantasy! Myriad adventures – sad, surreal, funny, potentially dangerous – await. 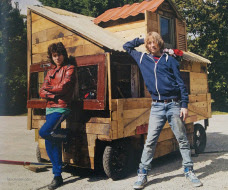 The best part of the film, however, is the sparkling dialogue between Daniel and Theo when they are building the house-car and when they are riding in it. Here is a buddy film for the intellectual set. Theo (Theophile Baquet) and Daniel (Ange Dargent) are ready to rock and roll in "Microbe & Gasoline. MG has said he is drawn to emotions, and they inform much of the conversation between scientific-minded Theo and artistic Daniel who is experiencing existential crises, including puppylove. The young actors take to the dialogue like a duck to water, fiercely owning the words coming out of their mouths. Their exchanges have nuance and depth often lacking in characters their age. “Microbe & Gasoline” is a coming-of-age film that has wide appeal. IT’S a harmless, offbeat, not particularly interesting romantic comedy set in New York City. What else to say about “Maggie’s Plan,” the latest from director Rebecca Miller who also wrote the script? It has its U.S. premiere tonight at the 53rd New York Film Festival. Ethan Hawke (John) is credibly clueless as the man volleyed between Maggie and Georgette, a cold, superior, dismissive, self-centered, self-possessed, superstar anthropology professor at Columbia University. She is portrayed by Julianne Moore, speaking in a superfluous, vaguely Eastern European accent. All three work in academia, actually. Ethan Hawke and Julianne Moore in "Maggie's Plan." Maggie’s plan: return John to Georgette. He left the latter – the mother of his first two children – for the former because he was not getting enough love, support and understanding. Maggie’s wants no more of him because after he gives her a child he seems to have no more LSU. It is this quagmire and GG's performance that are the only interesting aspects of the film, saving it from utter tedium. An honorable mention is that Maggie is not cast in the role of homewrecker; John gets and deserves that dubious honor. Maggie’s plan initially works, then sputters, backfires and finally rights itself. All and sundry return to co-parenting. Visit http://www.filmlinc.com to learn more about the 53rd New York Film Festival, including showtimes and venues.